As the Napoleonic era receded into the past, new reforms meant that the uniforms worn by the Russian army had soon changed beyond recognition. Soldiers’ dress was not only tailored to modern military life, but also to the shifting whims of 19th-century fashion, including dyed moustaches. The ongoing campaign to conquer the Caucasus also resulted in distinctive new elements in the Russian military wardrobe. The Napoleonic era of military dress ended almost simultaneously with the death of the French Emperor in 1821. Four years later, reform of the Russian army’s uniforms began immediately after the death of Tsar Alexander I, who had defeated Napoleon on the battlefield but lagged behind him in matters of army organization and uniform development. The main innovation under his successor, Tsar Nicholas I, was to abandon some old clothing elements. Out went the frock-style double-breasted uniform, elongated at the back and with a shorter front. A single-breasted uniform jacket extending evenly to the hips gradually came in, while britches were replaced by trousers that were tucked into boots. After several modifications over the years, the tall cylindrical shako hat was phased out as the army’s main headwear and replaced by the cap. A. Ladurner. An engineer battalion is buildingfortifications, 1840s. First appearing in the late 18th century, it was not immediately widespread and served more as informal off-duty wear. 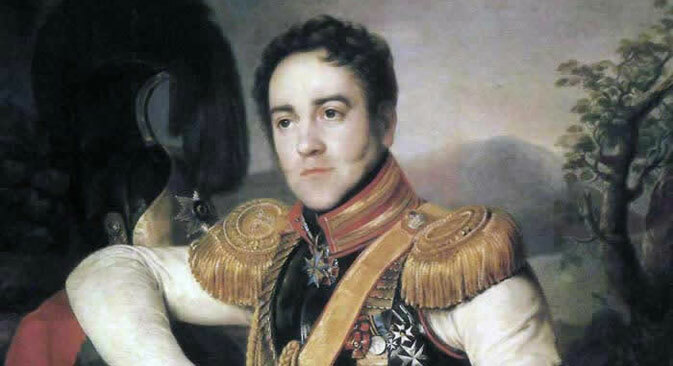 Regular cap wearing was more of a statement of self-image than regulations, and the peakless cap was, for example, a key element in the wardrobe of Marshal Mikhail Kutuzov, who defeated Napoleon. By the mid-19th century everything had changed. The peakless soldier’s cap became standard wear, while officers wore caps with visors. The helmet also replaced the shako as ceremonial wear. Made of leather and with a metal frame, the skin was enamelled and a visor was attached at the front. An impressive Sultan horsehair plume was sometimes attached to the front, or a screwed-in metal finial in the form of a spike or a metal double-headed eagle. The famous Pickelhaube German spiked helmet, in which Otto von Bismarck liked to pose, in fact originated in Russia at the behest of Nicholas I in the 1840s, drawing on the form of the ancient Russian warrior’s helmet. The patent leather helmet had front and rear visors and was tipped with an ornamental flaming grenade. The Caucasian War, waged by Russia over several decades (1817-1864), saw the introduction of completely new uniform elements. The papakha highland fur hat became widespread in the armed forces, not just in the Caucasian theater but across the country. Another Caucasus item, the Circassian highlander’s close-fitting knee-length coat, also went into wide usage. Distinguished by a row of narrow pockets for cartridges sewn across the chest, the cherkeska was comfortable and practical and was picked up by the Cossacks before spreading through the entire army. Ceremonial versions were also a feature of the Tsar’s wardrobe. Under Nicholas I and in keeping with the fashion of the day, facial hair also flourished in the officer corps. All officers could now wear a moustache, which had previously only been allowed to certain ranks. Now the tsar and his top commanders also let their whiskers grow, but their subordinates had to dye their moustaches black. Epaulettes akin to modern designs also took root in uniform codes, the rank denoted by the number of stars attached. And the saber, an integral status symbol for officers since the rein of Peter I, was replaced by the epee dress sword, worn on a showy, braided sword belt. In 1862, helmets and peaked caps officially replaced the army kepi, which had a wide, straight visor. An oval badge denoted the individual corps, and officers also wore a Sultan plume. Overall, up to 1881 Russian army uniform still had many such impractical but distinctive elements, but by the close of the century major steps were taken to simplify uniforms. Instead of caps, small fur lambskin hats were introduced and then later replaced by caps with visors. Officers received white jackets in the summer, while the soldiers were issued with long blouse-like shirts made of thick fabric, which was originally used for gymnastics.